Household molds, like penicilium, cladosporium, stachybotrys and black mold are extremely toxic and can be a major health concern for anyone who’s been exposed, especially undetected exposure over a long period of time. And although some molds can be harmless to humans, those same molds can wreck havoc on your home and can cause structural damage, turning into a costly Hunstville AL household mold clean-up situation. Excessive Moisture – Caused by a plumbing problem, leaky roof, poor drainage or excessive humidity in areas like bathrooms or laundry rooms. 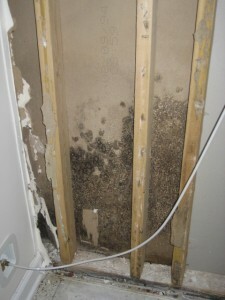 Food Source – Mold that feeds on wood, fabric, paper, leather, fiberboard, stucco, drywall and many insulation materials. It is very important that you test for mold, especially if you've experienced recent water damage or there’s an unexplained illness, where mold exposure is suspected. Don't wait. Call in professionals in this type of situation and make sure they have credentials and references. Also, call in a contractor for Hunstville Alabama mold clean up in larger or hard to reach areas, such as air ducts or behind walls because improper clean up of mold can actually cause it to spread and make matters worse. A professional Huntsville AL mold remediator should be able provide you a sampling analysis that follows guidelines recommended by the American Industrial Hygiene Association (AIHA), the American Conference of Governmental Industrial Hygienists (ACGIH), or other professional and credentialed organizations. Don't wait. Please give us a call at 256.539.7236 or send an email, and let us know how we can best serve your Hunstville AL mold testing, remediation and clean-up needs.